Kick your cycling up a notch with clothing that will keep you more comfortable and more efficient on your bicycle. From jackets and jerseys to shorts and tights, high performance clothing will help keep you cool when it’s hot, and warm when it’s cold. 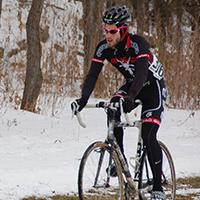 Gloves, shorts and shoes are particularly important as they protect your body at the points of contact with the bike. Body Geometry products from Specialized have been designed and tested with input from doctors and ergonomic experts to make sure nerves are protected and blood flow is maintained. A good bike jersey can improve your ride, by wicking moisture from your skin to keep you dry as you ride and by protecting you from UV rays. They are also designed to make you more comfortable by fitting your riding position, including extending longer in the back, and to be more convenient with pockets for tools, food and other necessities. Cycling jackets are designed to cut the wind, resist the rain, reflect lights at night, and pack small to fit in your seat pack, if not your jersey pocket. Cycling tops are also tailored to minimize flapping in the wind which is both annoying and inefficient. If we had to pick just one clothing item that will improve your cycling, we would suggest bike shorts with a quality chamois pad. Try a few on and find one that fits you well (hint: make sure you mimic your riding position while trying them on – they’re not designed to fit while you’re standing up!) and it will improve your ride. 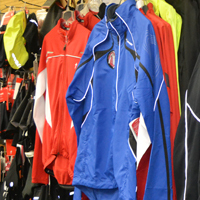 We keep a wide variety of bike shorts; they look similar, but do vary by chamois design and panels to improve fit. For colder rides we have tights to keep your legs warm throughout the winter months. Although you can ride a bike in just about any shoe with platform (flat) pedals, taking the step up to cycling shoes with clipless pedals can greatly improve your efficiency and comfort while riding. Cycling shoes are stiffer to protect your foot and attach to the pedal to give you enhanced pedaling performance throughout the whole motion of your pedal cycle. 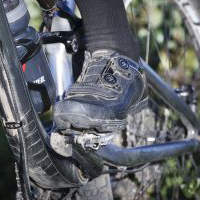 There are different shoes for road biking and mountain biking. Some are better than others if you expect to spend some time walking in the shoes (going into the coffee shop, for example). 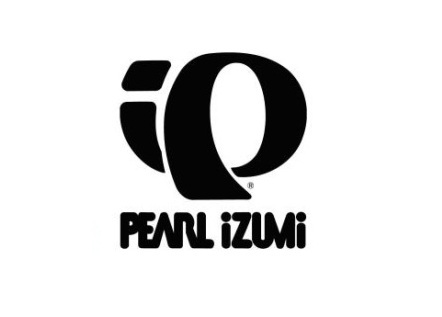 Specialized shoes are developed through a partnership with Dr. Andy Pruitt of the Boulder Institute for Sports Medicine, helping to make the most ergonomically advanced shoes available. Using a built in varus wedge, a metatarsal button and enhanced arch support, features that you have to pay extra to have in other shoes, Specialized shoes are designed to minimize the common foot problems posed by cycling and to create a measurably more efficient pedaling motion. Socks are also a crucial part to the performance of any shoe. Today’s socks are designed to maximize wicking (keep your feet dry) and minimize soreness or hot spots. 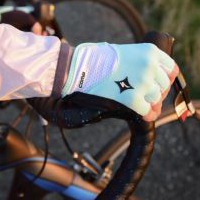 Bike gloves are key in all seasons as they serve several purposes, but the most important being to reduce fatigue and discomfort by cushioning your hands while riding. The best gloves have padding specifically designed to reduce hand numbness by relieving pressure on the ulnar nerve in your hand. You’ll also find other features like reflectivity and absorbent material on the back to wipe sweat. Cold-weather gloves, in addition to being full-finger gloves, will often also extend the cuff to protect the wrist and lower arm from the elements. Fall and winter gloves will also add wind and water protection and are available in a variety of insulations, depending on what weather you expect to find while riding.